Pruning examples of a few before and after pictures of old apple trees brought back to life to produce a robust crop of fruit for this home owner while adding a beautiful eatable landscape to their landscape design. Maintaining your fruit production takes resources, time and effort. For those who do not necessarily have that amount of time, King Street Vineyards can help. We provide an annual Service Agreement that takes care of everything from Spring pruning and keeping grape vine trenches clear of weeds, to annual fertilization and pest and disease spraying programs. Basically, your fruit will be tastier and healthier looking. You see many creatures and nasty things wish to consume your fruit before you do. 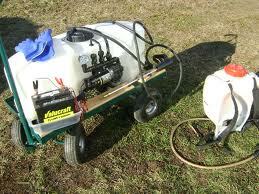 Spraying will help control the diseases and insects that will want to rob you of your yield. King Street Vineyards works closely with certified crop services, licensed in New Hampshire for spraying fruit for disease and aggressive insects. We use the IPM (Integrated Pest Management) approach recommended by the U.S. Environmental Protection Agency. This means monitoring for insect and disease pests and treating for only those pests present and only if they are present in sufficient numbers to be damaging. Cultural controls are also employed to reduce pesticide applications. All spray programs are tailored to your individual requirements. Pest pressure varies by location and different growers desire different levels of control.